We believe that the objects in our lives are talismans of beauty. These objects ground us, create space for clear thoughts, and help us connect with ourselves and the world around us—past, present, and future. Beauty is found in the texture of natural materials, the simple forms and lines of everyday objects, the marks left by the hand, and in the creative process born of utilitarian needs. Handmade objects have the ability to bring comfort and well-being into our lives and homes. Inspired by craft traditions from around the world, we are dedicated to designing and producing beautiful objects for daily use. Woodspirit HANDCRAFT is a small operation consisting of Jarrod, Jazmin, and an assistant. Find out more about us here. Goods are made in small batches and finished by hand in our workshop in Ashland, Wisconsin. We use locally sourced wood and non-toxic, food grade oils, pigments, and milk paint. We want to increase appreciation for the handmade as well as encourage the use of woodenware in daily life—for its beauty, durability, and because it connects us to the natural world. 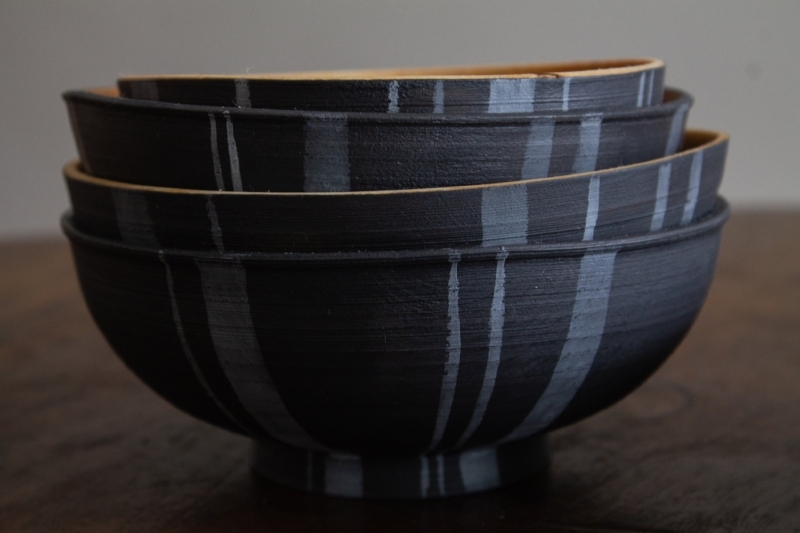 Bowls, plates, cups and other woodenware are designed and made using a foot powered pole lathe and a Japanese electric lathe. The design begins on the pole lathe. Its slow speed allows for the careful consideration of proportions, shape and texture. The designs are then produced with both foot powered and electric lathe. Fresh, green wood is used to create these objects. As the wood dries the objects bend and move and in this way are also shaped and influenced by the nature of the wood. This movement enhances the beauty and organic shape of the pieces. Axe marks, wood grain, and tool texture add additional personality to each piece. The wooden spoon is an ancient and iconic object. It is a small handheld sculpture bound to utilitarian function. It is also where that function meets the balance of proportions, shape, and texture. Our spoon designs are inspired by traditional forms from all over the world, but predominantly from Sweden and Japan. They are made using a variety of techniques and finished with a knife. Our wood is sourced locally and worked green or fresh whenever possible. Napkins, handkerchiefs, and other textiles are woven in small batches on a floor loom with natural fibers like linen, cotton, and wool. Some fibers are also grown, processed, hand-spun, and hand-dyed with indigo, birchbark, and other natural dyes. Traditional and historical patterns and colors are a primary source of inspiration for the designs. Birch bark has a rich tradition around the Northern hemisphere. Its qualities are often compared to leather. It’s flexible and resistant to rot, so it is well suited for weaving baskets and forming into boxes and containers. Because of the limited supply of locally harvested quality bark, we offer small quantities of canisters and other woven baskets, knife sheaths, and ornaments throughout the year. Jarrod enjoys teaching and sharing his experience with others, especially younger people who have an interest or desire in incorporating craft into their lifestyle. Classes include spoon carving, green woodworking, wood turning on a foot-powered lathe, and birch bark craft. Courses last from 2 days to 2 weeks. His desire to train future craftspeople has resulted in hosting several apprenticeships and mentoring. Currently, he employs an assistant to help with production and as a way of exploring how to teach in-depth skills over a longer term. Jarrod has been an active blogger, sharing the thoughts, ideas, and experiences of his 25 plus years as a professional woodworker and former homesteader in Northern Wisconsin. He also writes articles for magazines and has a forthcoming book on pole-lathe turning. He travels to teach handcraft, to study in museums, to collaborate with and to learn from other makers. He works to promote community between craftspeople across borders.